It’s the final countdown. Christmas is around the corner and we’ve been busy pitching ideas for gifts to give, holiday visuals to create, and altogether closing this year with a bang. There will be no time for Mr. Grinch, as Christmas is a time for giving. The pressure is on as we have spent the past few months running around collecting supplies and buying gifts for our most loyal clients. This year’s Christmas box theme is ‘A Taste of California.’ The theme required us to think strategically about what we could add to each of the boxes. Of course, we ran into a few bumps along the way. Some of our purchased items arrived later than expected, ran out of stock, or did not work out in the end. This meant we had to head back to the drawing board and decide how best to correct the situation and meet our deadline. The mission of the Christmas boxes was not over yet. After gathering the necessary items, it was time to get to work on the boxes and complete the task in the most efficient possible manner. At times, our project began to feel overwhelming from the amount of work required for a small team. Yet, we didn't let this stop us and enjoyed working with local businesses and seeing their dedication to giving us a memorable experience. We also couldn’t be happier to send a personal thank you to our most loyal clients for continuing to choose us in supporting them with their cases. Tired but also feeling accomplished, our team finished the boxes. We high fived as the last shipment of boxes was finally sent out. Our attention was now directed back to another project, the Gingerbread Man. This project has taken a multitude of collaboration as team members from multiple departments have shared ideas about how and what the graphics should be. Over the weeks, designing took place and graphics were scrapped; only to begin again until we felt the animation was right. 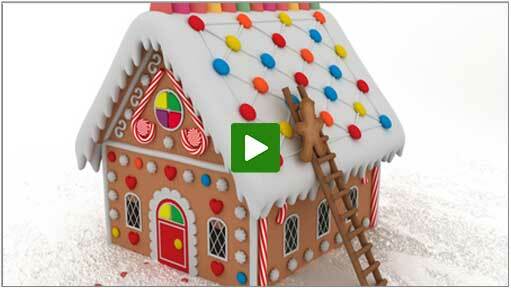 Now, we get to share the fun holiday project with you. This year has seen its fair share of projects. If you have not already heard, the 6th Annual Golden Advocate Awards is upon us. The awards allow us to recognize the determination and hard work of attorneys and law firms as they fight on behalf of their clients. Be sure to stay tuned, the winners will be announced at the beginning of the New Year! Speaking of the New Year, can you believe that the year is almost over, and another will soon begin. Time sure does fly by! The year has been a whirlwind of projects and we enjoyed being a part of each one. Our team loves to be able to celebrate with each of you when we hear that you achieved the settlement or verdict your client deserved. As the countdown comes to an end, we're glad our projects have been completed and the Christmas festivities can begin! We look forward to starting a new year and being a part of your team on the next case you take on. From the DK Global team, we wish you and your family a very Merry Christmas and a Happy New Year!